To save you time, here is my summary of Are You Sure We Teach the Shooting by Holger Geschwindner, so you can watch the specific things that I feel are the most relevant. Gerschwinder is a mentor and shooting coach of Dirk Nowitzki. Here is an older video of him working with Dirk (Video). To focus the learner on keeping the elbow in on the lay-up he gets the shooters to “click their elbows” after picking up the ball. This means their elbows touch after ball pick-up. Later on in the video he talks about his elbow in technique as being even more important when a player is approaching a lay-up from a flat angle to the rim (9:58). It gives them a better angle and release point for the lay-up as the ball stays inside the body the whole time. Coach Oliver Note: This is an interesting emphasis. I have always thought that players should be comfortable with different release points on lay-ups. By encouraging shooters to keep their elbow in on the lay-up it forces them to only use underhand lay-ups (scoop shots). The ball protection concept of “clicking their elbows” does provide a good frame of reference for a learner to understand what it means to bring the ball tight to their body before the release. He feels shooters should release the ball with the index finger and middle finger as the last contact points on the ball. On the end of the shot if there is one finger on the ball it is more likely that you will miss left or right if you are a little off. With two fingers it is much easier to repeat and be in control of the release. Good shooters miss long and short, not left or right. He uses a lot of self-toss jump stops into pivots before the offensive player puts the ball on the floor prior to the lay-up. Here is an another example of using pivots before lay-ups (30:54). Coach Oliver Note: This is a concept that might be worth investigating as a method for teaching pivoting. 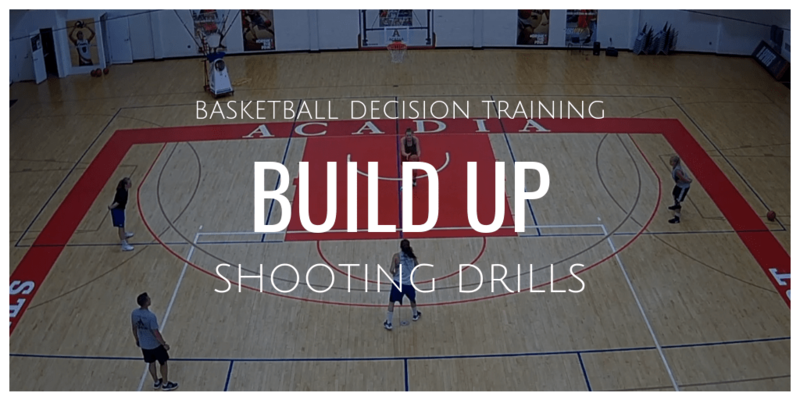 I like ending everything we do in skill workouts with a shot, plus it is a way to incorporate pivoting into your practices in a more dynamic way than training pivoting in isolation. I would not, however, imitate this drill as it does not account for time-on-task (the number of physical repetitions). If you do consider moving players to different locations so multiple players are applying his concepts for frequently. He emphasizes that players don’t look at the ball on the dribble and lay-up by having them look back at the coach. The player going in for the lay-up has to call out how many fingers the coach has up. He is trying to develop the concept of seeing what the defense is doing. Coach Oliver Note: This is an attempt to bring some decision making to the basic lay-up drill. We would do the same thing with our BDT signals. An offense player could be placed outside the three-point line. A hands up signal would cue the player going in for the lay-up to pass. Full two player BDT would then continue. If no hands are up then the offensive player scores the lay-up. Coach Oliver Note: Check out this move. He does some interesting stuff with the pivot before the lay-up. I am pretty sure I would never teach this but it is worth a watch. To complete this move it requires ball skills. He says he teaches it so that players understand how much time they have on their way to the rim. It does challenge their ball skills and ability to finish at the rim after the move. He shows a progression of dribble and ball pick-up actions prior to the lay-up. It starts on the baseline close to the rim. Coach Oliver Note: I see this as an application of the ball pick-up skills we teach in our Zero Seconds concepts. I also see the similarities to some of the drills he does with Nowitzki in the above video and some others on YouTube. Don’t stop if you think you did something wrong; the coach will communicate with you to stop if they want you to. In a game, the referee will. Otherwise play through. Every offensive player has a minimum of three options. The key is one-on-one. If every player can beat their check one-on-one the team will be stronger. Every shot is unique. You only have to make one shot in your life, the next one. If you make only the next one then every shot is in. The ball is your friend. Don’t beat the ball on the backboard on the shot. Try and be as soft as possible with him on the rim or backboard. You don’t have to look at the ball. The ball does not disappear. He says they usually do a skill until they have six successful moves because after six successful moves the brain starts to believe it can do it. Every move in basketball is preparation for the next move. I will be honest – there were a few times I thought about stopping the video. It is repetitive and basic on occasion. However if I can learn a few things that can be applied to my coaching then I feel there was value. I liked the Two Dribble Changes into a One Step Lay-Up as I see the application to some of our Zero Seconds teachings. He also had some great expressions and communication cues that I liked. What is your favorite shooting expression or communication cue?